Having even five minutes to yourself seems hard to come by as a parent. Forget the days where you could sit down and read a book, watch a movie, or do anything else leisurely. Chances are, it's hard to find even a moment to use the bathroom in peace, what to speak of getting chores or errands done. It takes some trial and error, but I eventually found the tools to help me get a moment or two to myself. Meet the Oball Obounce Activity Center. 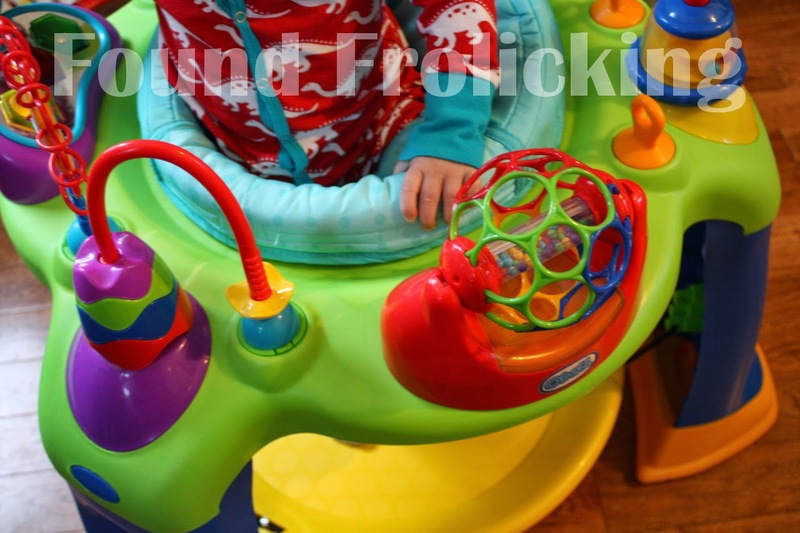 This colorful and very interactive activity center features 15+ activities! I love the vibrant colors, and the intelligent design of this activity center. It is rated for babies 4 months and over, and certainly offers toys that can be appreciated and enjoyed by infants and young toddlers. 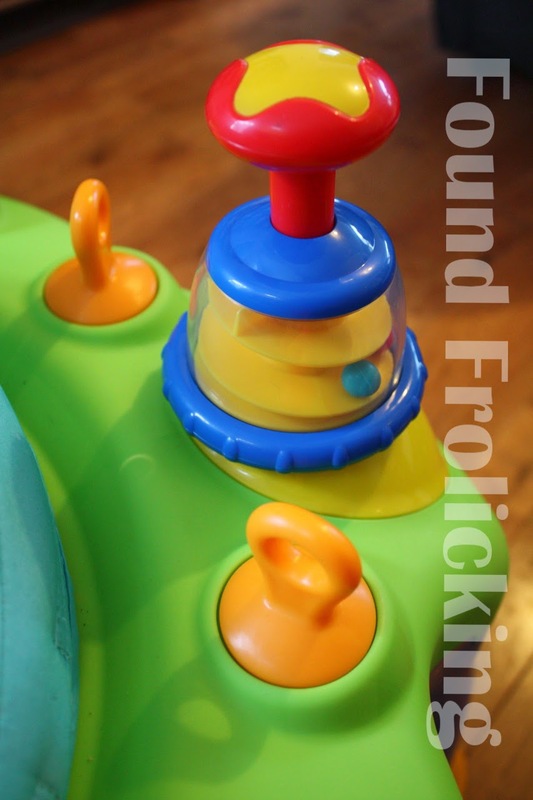 The three different height adjustments allow your little one to enjoy the product into toddlerhood, just like Baby E! I have previous experience with exersaucers and jumperoos. 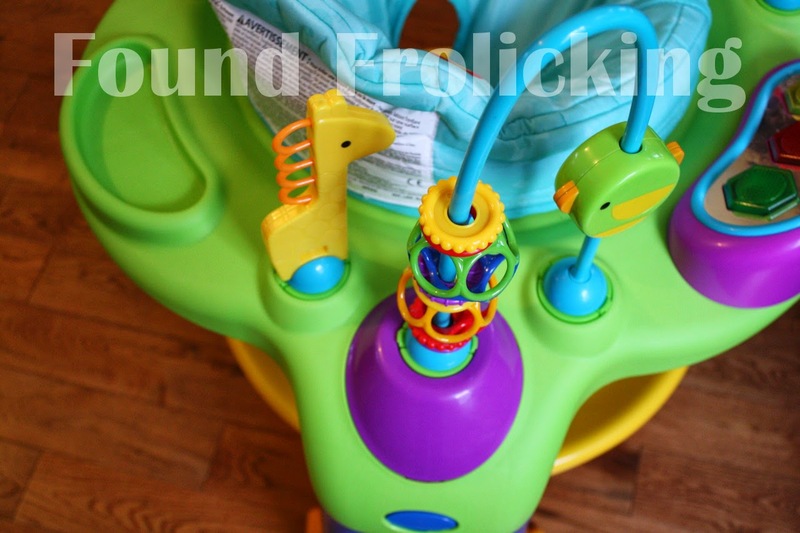 I wasn't sure what to expect from the Oball Obounce Activity Center initially, since we never had much luck with either exersaucers or jumperoos. One thing I noticed is that more and more of these types of products on the market feature toys where each requires batteries. While I think things that make noise or flash lights are great, I don't personally think that's what the entire unit should comprise of! The Oball Obounce Activity Center has two toy activities that require batteries, but the rest do not. There is a well-balanced variety in the toys offered, something that gives your little one plenty to explore and play with. 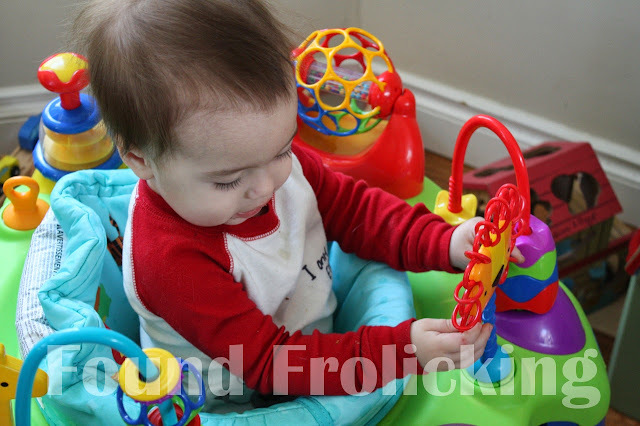 Baby E was quite taken with the Oball Obounce Activity Center as soon as the parts were out of the box! The bright, fun colors attracted him before it was even put together. Assembly was simple and easy, which is a big bonus, as any parent who's assembled baby products with lots of little parts would know. It's very light, which is another bonus for me, since it makes it very easy to move around the house as needed. Once it was ready to go, Baby E was excited to be placed into it, and sat there happily for half an hour without making any squeals of protest. He seemed to enjoy interacting with each toy on the activity center. This is amazing for Baby E, who would sit for no longer than 5 minutes in either an exersaucer or jumperoo in the past! 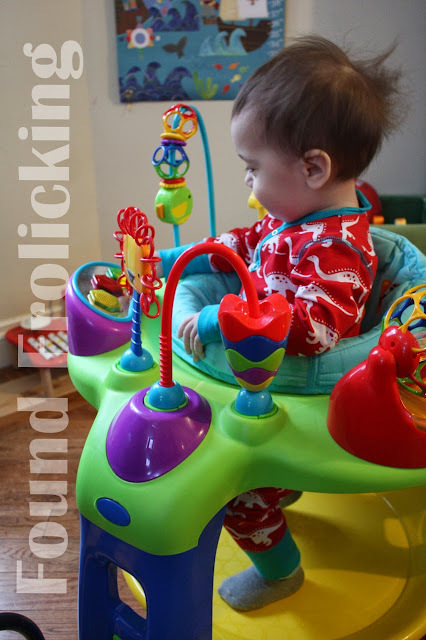 He has continued to enjoy using the Oball Obounce Activity Center on almost a daily basis. 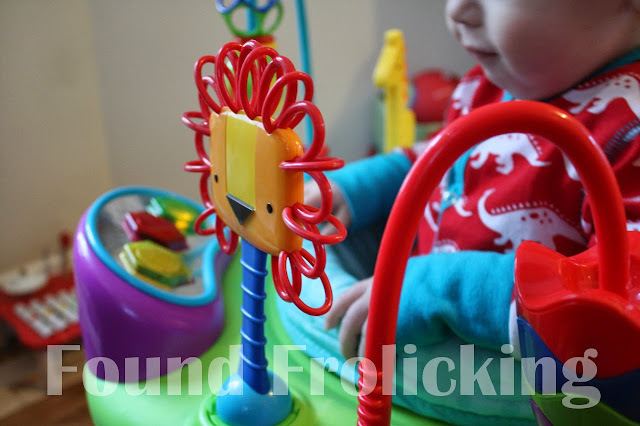 His favorite toys at the moment are the spinning push toy, and the toy with musical buttons. 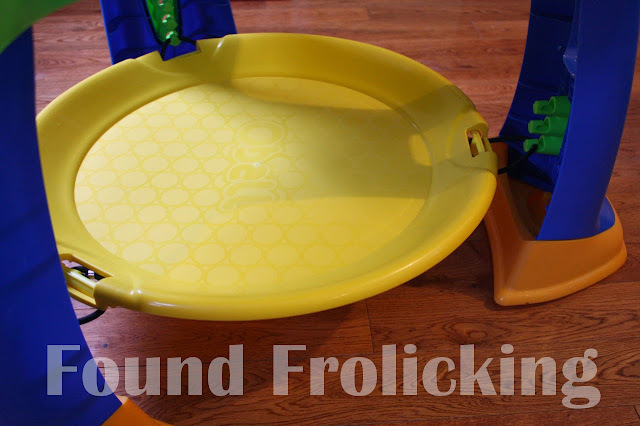 I would certainly recommend this to any parents currently looking at exersaucers, activity tables, and jumperoos. It is definitely top-of-the-line! See the Oball Obounce Activity Center in action right here in the video review. For more information about the Oball and their products, please go to the Kids II website. To learn more about the Oball Obounce Activity Center specifically, please click here. You can find the Oball Obounce Activity Center on the Toys R Us website, or look for it in your local Toys R Us store! 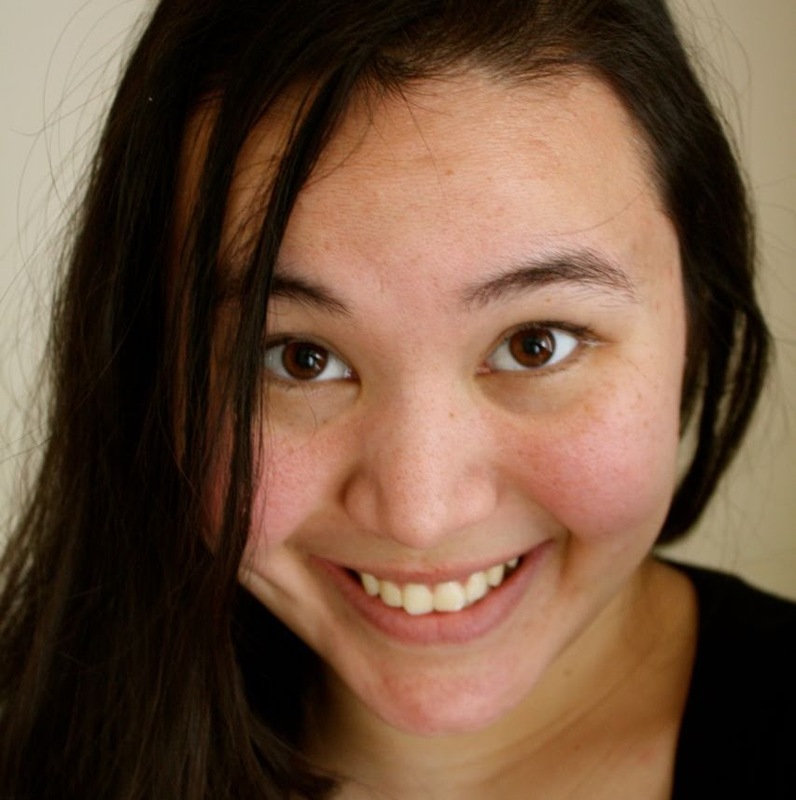 You can find Kids II on their Facebook page, follow them on Twitter, and follow their Pinterest boards. A view from above the Oball Obounce Activity Center. Baby E in the Oball Obounce Activity Center first thing in the morning! 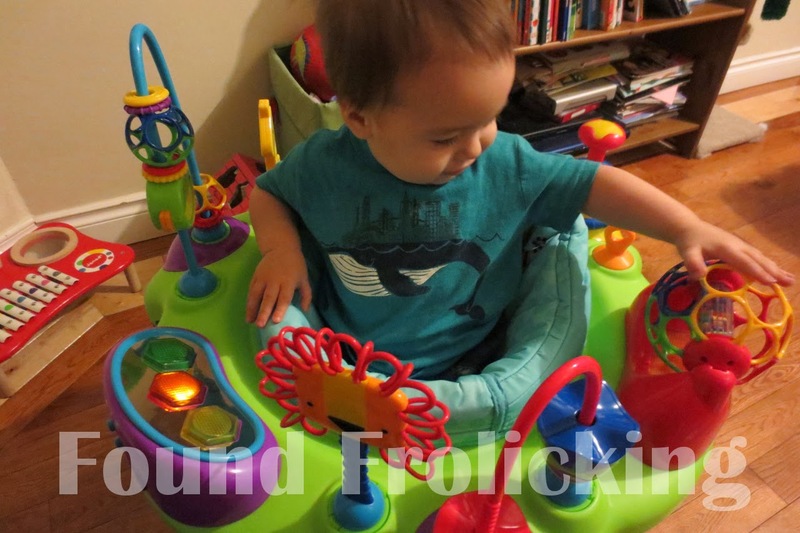 The unit that lights up and makes music is one of Baby E's favorite activities! A view showing how close all of the toys are to your child on the Oball Obounce Activity Center. Baby E spinning the Oball toy that lights up underneath! Showing the Oball Obounce Activity Center from the opposite side, including the snack space. A close up look at the spinning toy. A closer look at the adjustable base of the Oball Obounce Activity Center. Baby E playing with the spinning toy! 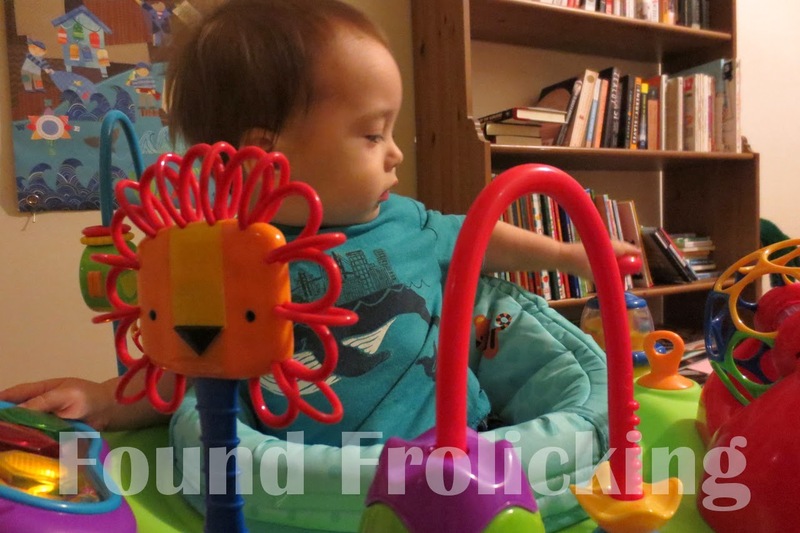 Baby E interacting with the adorable lion toy on the Oball Obounce Activity Center! This looks awesome! We have a similar "saucer" for we used with my niece that she loved but it wasn't nearly as interactive as this! What a wonderful review. Saucers have come so far in the past few years. Thank you. Oball Obounce Activity Center has gone the extra mile. This is a playground for babies. It's like bringing the park home to babies and toddlers. I love the colors and the interactive toys. 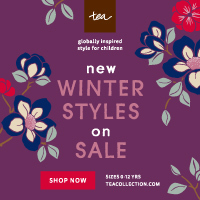 Most babies will love it. I have to get this for my Grandchild. It looks like such fun!!! The excersaucer we used for my older two children looks BORING compared to this one! No wonder they would only tolerate it for a few minutes at a time. I will definitely look into purchasing one of these when our third gets a little older. This looks like a fantastic play center. The toys are colorful and interactive. And I agree with you, not having everything run on batteries is definitely a plus! 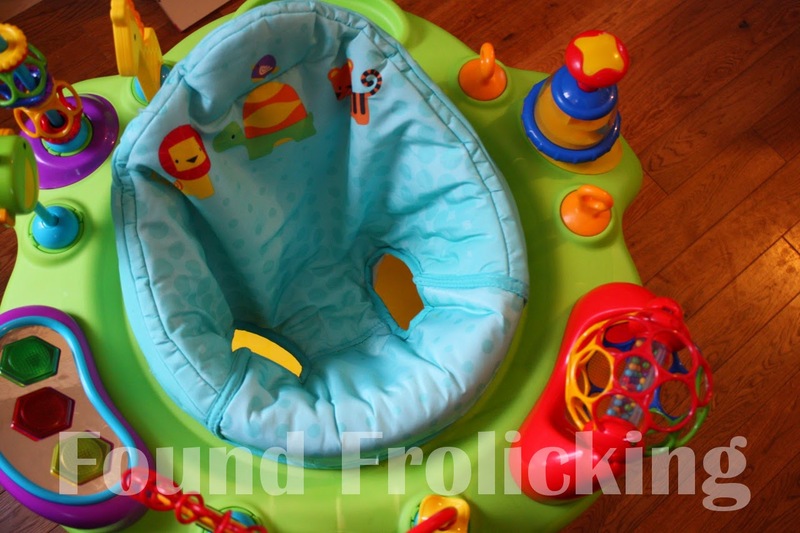 The excersaucer that we used for my 16 month old was nothing compared to this, it was a hand me down and required so many batteries that everything lit up and made noise. This scared my daughter in the beginning because whenever she would touch something it would startle her until she figured it out. This one looks great! I love the mesh ball that was my daughters favorite toy. this looks awesome! i've used exersaucer with all my kiddies and it looks nothing as fun as this would be!!!! thanks for sharing!!! Omgoodness, we LOVE OBall products!! I cannot believe that they have come out with an exersaucer. Thank you for such an awesome review. This is now on my list for Baby #2!! 30 minutes?! That's amazing really! The little mesh ball looks like it'd be very entertaining. It looks like so much fun I wish they could they could make the for adult. That way if my husband is been a pain I can put him in it. Is that bad? This looks like the coolest bouncer/entertainer I have seen in a long while. May have to do some investing! Where are these products sold and what is the Msrp? I find it difficult to spend too much on something my child will use for a few months before he grows out of it. Though there is always baby #2 to consider. What are your thoughts on the difference between a saucer, bouncer, or walker? I currently have a walker but it has far fewer toys to keep baby entertained. Also, as a first time Mom I'm probably overly picky and protective. So I must ask, how is the seat, is the baby well supported? I hear concerns about hip dysplasia and that these sling seats could do damage if they are not supportive or ergonomic. I would like to have this for my nephew. He is challenged, his parents are not working with him. I think this would really help. He will have one more learning toy when he comes to see me. both my boys loved their Oball and their exersaucer....I can only imagine how cool the two combined would be!